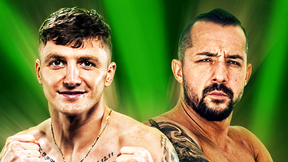 PRIDE Final Conflict 2003 delivered the semifinals and finals of the Middleweight Grand Prix as well as one of the greatest heavyweight clashes as Antonio Rodrigo Nogueira faced Mirko “Cro Cop” Filipovic for the interim PRIDE heavyweight title. Wanderlei Silva vs. Quinton Jackson PRIDE: Final Conflict 2003 Sun, Nov 9, 2003 (17:52) With the PRIDE 2003 Middleweight GP title up for grabs, two terrifying TKO-ing juggernauts collided as Quinton “Rampage” Jackson, riding a 7-fight win streak, faced PRIDE middleweight champ Wanderlei “The Axe-Murderer” Silva, who was unbeaten in 14 fights. Minotauro Nogueira vs. Mirko Cro Cop PRIDE: Final Conflict 2003 Sun, Nov 9, 2003 (15:07) The November 9, 2003, battle for the interim Pride heavyweight championship was one of the most anticipated fights of the year. Fans couldn’t wait to see Minotauro Nogueira pit his BJJ submission skills and legendary toughness against the striking and terrifying knockout power of the undefeated Mirko Cro Cop. Kazushi Sakuraba vs. Kevin Randleman PRIDE: Final Conflict 2003 Sun, Nov 9, 2003 (29:13) Both aiming to rebound from KO/TKO losses in their previous PRIDE bouts, two very different grapplers collided as the all-powerful former 2x NCAA D1 National Champion wrestler Kevin Randleman took on the submission savvy catch-wrestler Kazushi Sakuraba. Heath Herring vs. Yoshihisa Yamamoto PRIDE: Final Conflict 2003 Sun, Nov 9, 2003 (27:48) After suffering back-to-back losses to two of the division’s best, “The Texas Crazy Horse” Heath Herring needed to return to the winning track as he readied his all-offense style for a scrap with Japanese pro wrestler & MMA veteran Yoshihisa Yamamoto. Dan Henderson vs. Murilo Bustamante PRIDE: Final Conflict 2003 Sun, Nov 9, 2003 (6:24) In a PRIDE 2003 Middleweight GP reserve bout, former UFC middleweight champion & BJJ blackbelt Murilo Bustamante, with his 9-2-1 pro record, took on former 2x US Olympic Greco-Roman wrestler Dan Henderson, who had a 13-3 pro record. 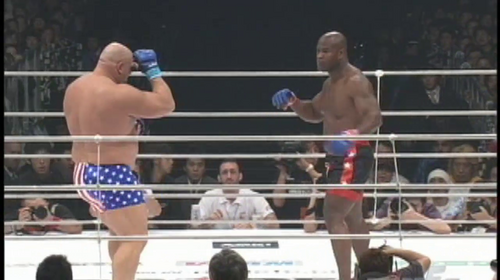 Wanderlei Silva vs. Hidehiko Yoshida PRIDE: Final Conflict 2003 Sun, Nov 9, 2003 (25:30) What a war! Riding a 3 fight submission win streak since making his MMA debut, 1992 Japanese Olympic judo gold medalist Hidehiko Yoshida faced PRIDE middleweight champ Wanderlei “The Axe-Murderer” Silva in the PRIDE 2003 Middleweight GP semifinals. Rampage Jackson vs. Chuck Liddell Pride Final Conflict 2003 Sun, Nov 9, 2003 (16:11) With UFC president Dana White calling the action from ringside, the UFC’s Chuck Liddell entered the Pride Middleweight Grand Prix looking to land a dream match with Wanderlei Silva. 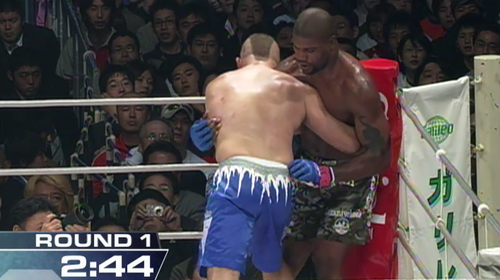 However, Pride contender Rampage Jackson vowed to ruin the Iceman’s plans by knocking Liddell out in this quarter final match-up. Gary Goodridge vs. Dan Bobish PRIDE: Final Conflict 2003 Sun, Nov 9, 2003 (5:30) After having his 5 fight unbeaten streak snapped, “Big Daddy” Gary Goodridge aimed to get back on the winning track with his explosive fight finishing style against former NCAA D3 National Champion wrestler Dan “The Bull” Bobish with his 9-4 MMA record.